Have you noticed that over time, foods you used to enjoy seem to no longer be agreeing with you? There is a very good reason for this, and it is simply the fact that you are getting older. Aging causes changes in your body that actually impact how it processes food. Primarily, your metabolism slows down, leading to you needing fewer calories to maintain a healthy weight. Additionally, your body produces less of the fluids needed to process food in your digestive system, making it harder for your body to absorb nutrients. This means that as you age, it becomes more important than ever to make sure that the foods you eat are as rich in nutrients as possible. The United States Department of Agriculture offers some special recommendations for the senior diet, which include comprising half of your plate from fruits and vegetables and choosing low sodium food options. 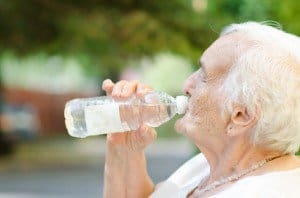 Water– As you age, your body will actually lose some of its natural ability to detect thirst. By not drinking enough water, you could put yourself in danger of becoming dehydrated, especially in the hot summer months. It is recommended you drink a minimum of 6 glasses of water each day. You can gain additional hydration from foods with a high water content, such as soups, melons, and grapes. Keep in mind that caffeinated beverages, foods high in sodium, and alcohol can all dehydrate you and counteract your water consumption. Healthy Fats– Get into the habit of checking food labels on the items you are purchasing. You want to avoid saturated fats and trans fats. Instead, incorporate more healthy fats into your diet, such as nuts, fatty fish, seeds, and avocados. Calcium– A calcium supplement paired with vitamin D is the perfect combination to help keep your bones healthy and strong. You should also try to incorporate calcium rich foods, such as low fat dairy products, into your diet regularly.